My name is Joy Kingston, Owner of Finer and I would like to take the opportunity to thank you for perusing my website and possibly considering my wonderful range of equipment and products for your business. Our website has been designed for easy navigation, just CLICK on the link or the picture above to read about the product of your interest. My business specializes in muscle re-education for Face and Body. I supply two different units, the Finer Face Microcurrent unit which gently re-educate the delicate facial muscles that are attached directly to the skin and the BodyPerfect EMS unit to tighten and tone the large body muscles which are attached to the bone. I don't only offer certified training with each unit purchased, but the best training available in the world. (Finer Face trains and certifies teachers in colleges who then on train students, you can't get any better than that). Finer also have a full range of Natural Skin Care which is Microcurrent compatible and a beautiful range of Pure Essential Oils and Carrier Oils along with all the accessories that go with Aromatherapy. 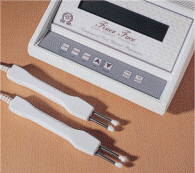 Whether you are considering updating your existing equipment or adding Microcurrent or Electronic Muscle Stimulation to your business, I hope you can consider Finer Face and BodyPerfect. My goal is not to persuade you with hi-tech advertising or promises that are impossible to achieve, but to provide you with honest and true information. I am always available to answer any questions or queries you may have so please don't hesitate to phone or email me at any time. "I hope your interest allows us to meet". Thank you for viewing our website and I hope your interest allows us the opportunity to meet.